Traditionally used by nomads in Mongolia, Siberia and Turkey, a yurt is a wood-framed, round tent covered in canvas or skins. Inside, most have a bed, a few pieces of furniture or scattered cushions and a wood-burning stove to keep toasty warm in cooler seasons. 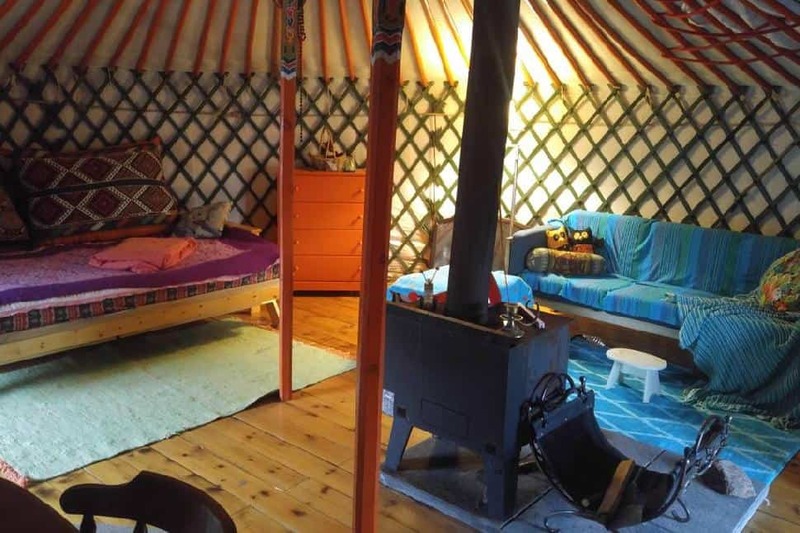 Yurts have become a popular alternative to tent camping, and can be found nestled in various wooded settings for a unique getaway. 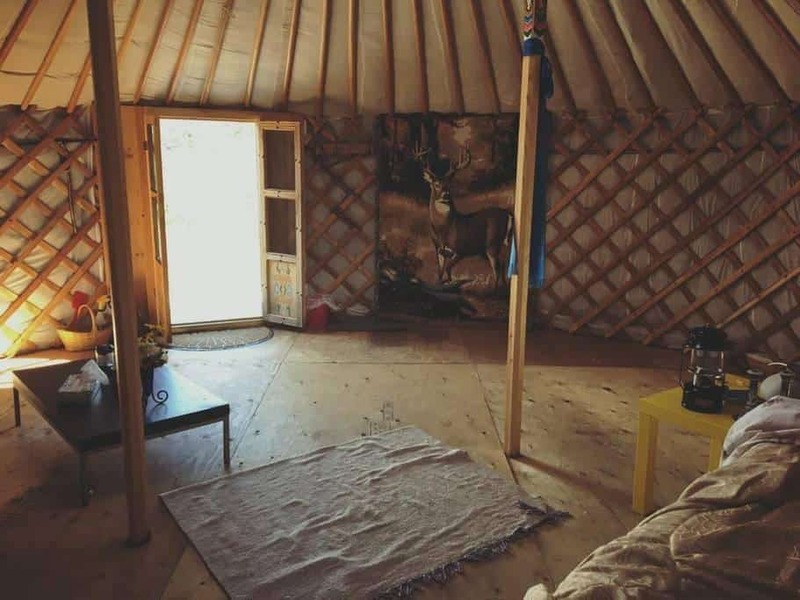 A rustic getaway just outside the town of Barry’s Bay, this yurt is a cozy escape from day to day life. 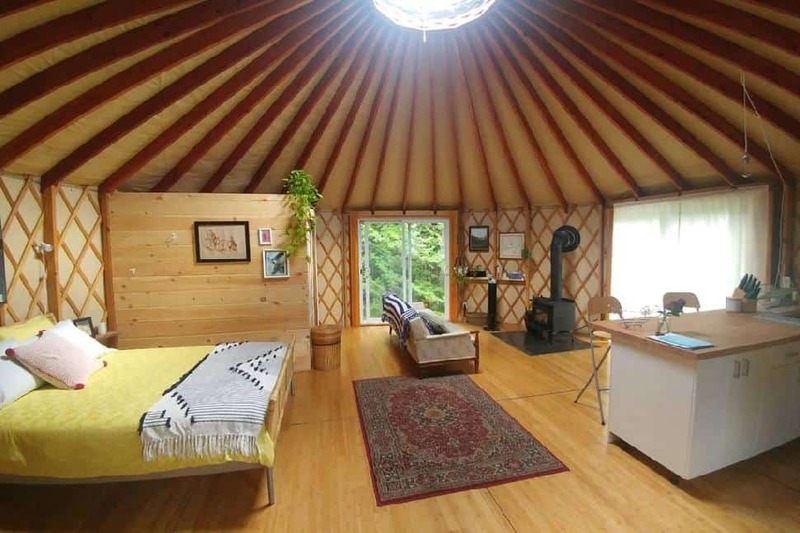 A domed skylight lets in the sunshine as you relax on the double bed or the sofa by the woodstove. Explore the woods and creek just beyond the yurt, head to the nearby Opeongo Hill Ski Club to use the trails or drive into town to visit local artisans and the historic Wilno Tavern, where you can enjoy traditional Polish food, live blues and country music. Located by the Salmon River and the village of Lonsdale, this meditative space is tucked next to beautiful Tyendinaga territory. The property features a limestone ridge, mini caves, old growth herbs and trees and a waterfall flowing peacefully just behind the yurt. 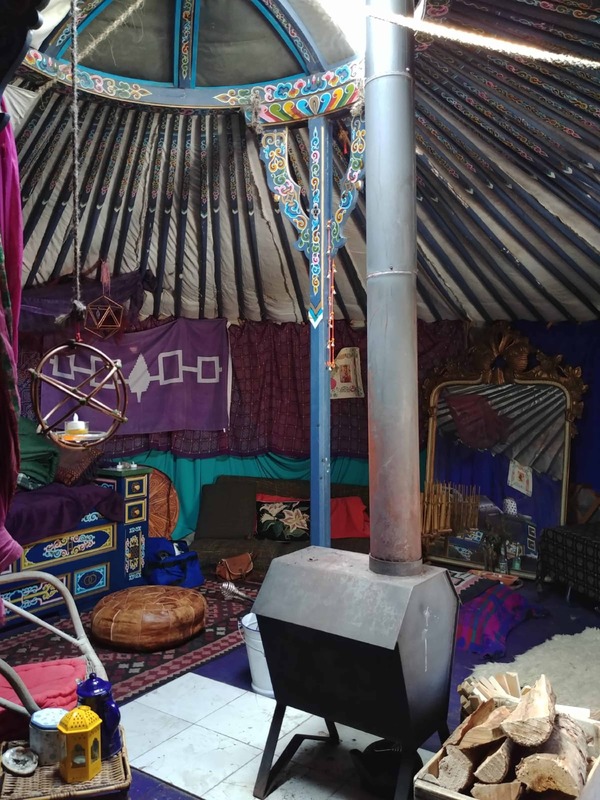 Artist and host Maureen Walton also offers use of a second smaller yurt as a ceremony space, incorporated into her guided retreats and women’s gatherings as a moon lodge. 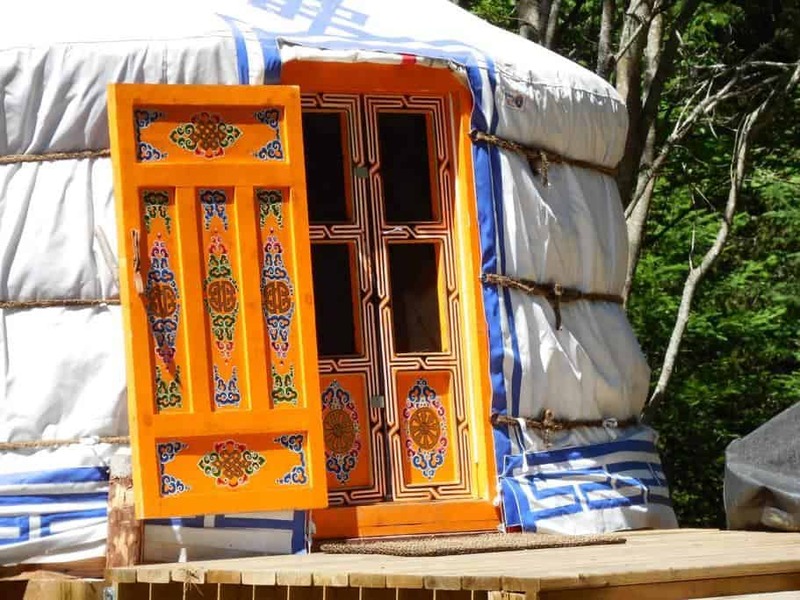 This traditional yurt located in Mattawan was actually built by a family in Mongolia. It is completely off-grid, with no cell service, so it’s the perfect place to disconnect. With water access to Bang’s Bay, guests can make use of the canoes, kayaks, SUPs and tubes offered by the hosts. There is also a wood-fired sauna with a unique manual pump shower inside for a relaxing soak after a long day of outdoor exploring. 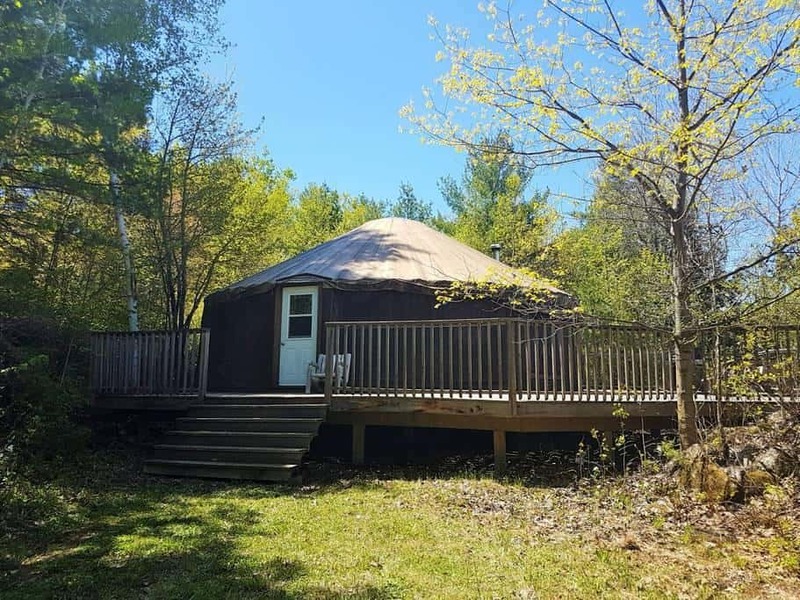 As the name suggests, this yurt situated in the Land O’ Lakes region of Southern Ontario is surrounded by fresh water lakes, rivers and streams. A waterfall cascades behind the yurt year round, creating a natural swimming hole where the water drops and eddies. The sky above the yurt is perfect for stargazing, and there is even a dark sky reserve twenty minutes away if you wish to experience constellations in the darkest skies of southern Ontario. The yurt is off-grid, but guests have access to the 150-year-old farmhouse fifty feet away for use of kitchen, bathroom and shower facilities. Found on Cade Lake near Tamworth, these 300 acres of wilderness give guests the opportunity to rejuvenate with a swim, hang out in the river rapids or enjoy paddling and fishing (canoe provided). With rolling landscapes of granite, forest, river and lake, hiking spaces abound. The site also features a screened-in gazebo for relaxing. In Lingham Lakes, Central Frontenac County, you will get a real backcountry experience on 350 acres of wilderness on the lake. There are 8,600 additional hectares of remote trails, streams and woods on the adjacent Mellon Lake Conservation Reserve. Explore the waters by canoe or have a lakeside bonfire before tucking into bed in your 32-foot-diameter yurt. 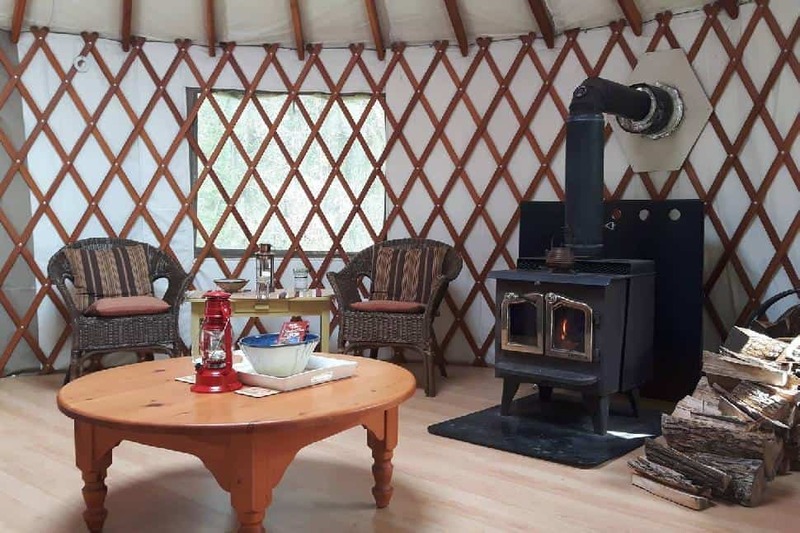 Owned by a florist, this yurt in the rural hamlet of Ivanhoe just outside of Madoc will have a small flower farm opening this summer for guests to visually enjoy during their stay. Located within a large Amish and Mennonite community, you can stop in at almost any nearby farm and purchase organic free range eggs and seasonal produce to take home, or to cook a meal on the indoor stovetop or outdoor barbeque. 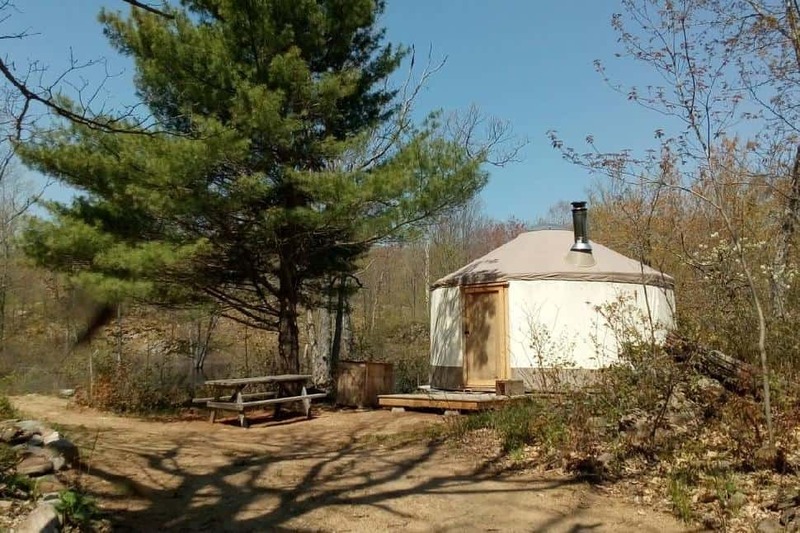 This yurt in Mono, Ontario boasts 10 acres of certified naturally grown herbs and berries, as well as beehives for honey, which can be purchased on site along with homemade herbal teas. The Bruce Trail is just a walk down the road. Mono Cliffs Provincial Park, the Boyne River and Pine River are a short drive away. Yoga, qigong and art classes are available on the property, as well as self-care and reflexology services. With three farmer’s markets near by, fresh local products abound. Many Ontario Parks offer yurts under “roofed accommodation” for campers who wish a bit more comfort than traditional tent camping. Some even offer electricity. 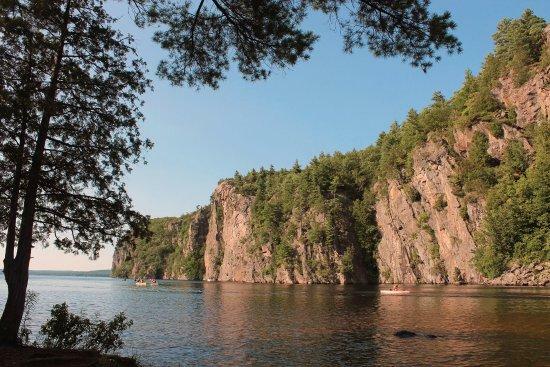 Provincial parks are a great way to experience Ontario wilderness. 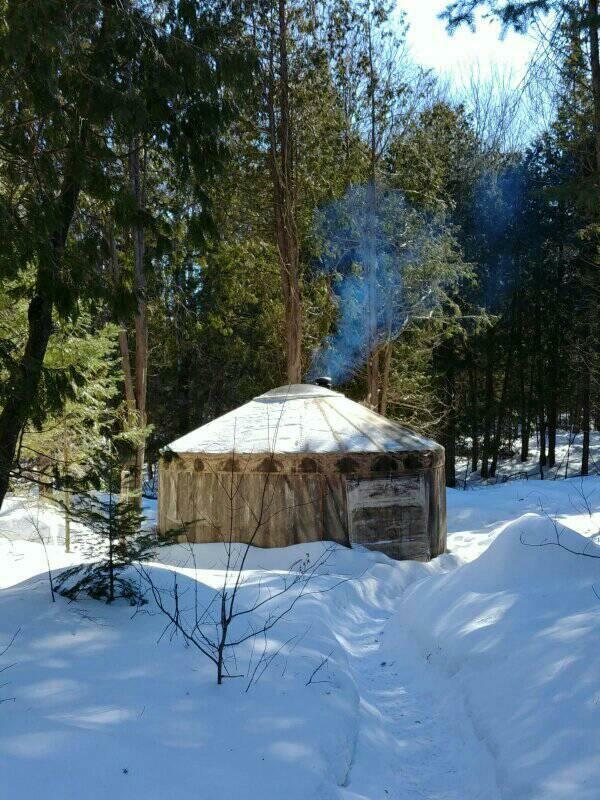 Some parks that offer yurts are Algonquin, Bon Echo, Killarney, MacGregor Point and Silent Lake. Ontario is a huge province traced with many trails, but we've managed to shortlist 25 of our favourite hikes.